Ask anyone who has been to an Oral History Association annual meeting and they’ll tell you that one of the best parts of the conference is the people. The conference offers the chance to meet and learn from oral history veterans, as well as those just getting started in the field. This week on the blog, we’re highlighting the OHA mentorship program, which aims to help newcomers at the meeting to get the most out of the experience by partnering them with mentors. The program paired 47 mentors and newcomers at the 2014 conference, and hopes to connect even more people going forward. I felt like I understood the infrastructure she was working within and the challenges and benefits that came with working in a state historical society. My focus with her was to speak with her early on in the meeting and get an idea of what her interests were, what her goals with the meeting and her career were, and help point her in the direction I would take at the meeting to best augment her current position needs and her future aspirations in the field. Mentorship isn’t a purely one-way relationship, however. It offers a chance for established members of the field to hear about the exciting things that newcomers are developing. I also just wanted to hear about the work she was doing. She was a working on logistics for some of their oral history projects—specifically dealing with immigrant groups. I have coveted Minnesota Historical Society’s ability to utilize specially designated funding to target immigrant groups in the state with a primary focus on oral history and storytelling. 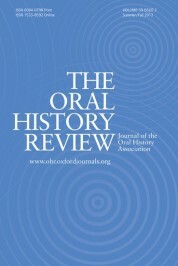 Mentorship allows the mentor to help direct the mentee’s professional development, but it also gives both people a chance to connect with another oral historian on a more personal level. Alise was great to spend time with. She was interested in the layout of the conference and how to get the most out of her time from a professional development standpoint and a personal growth perspective as well. She had a lot of great questions about the conference layout and who was doing what work. We walked through the conference agenda and talked about sessions that she might get the most out of, and we compared notes on kickstarting careers and our focus on oral history. After our initial scheduled meeting, we checked in a few times as we ran into each other in between sessions, had lunch with smaller groups of people, and met back up at the first time attendees breakfast. It turned out to be a comfortable and enlightening experience, I hope, for both of us. Mentorship is a great opportunity, but we all know that conferences tend to zip by at the speed of light. Conference schedules make every hour precious, so it’s not surprising that potential mentors feel like they can’t afford to spare the time. When the second call for mentors came out, I thought “okay, I can do this, I just hope they don’t have high expectations of what they are going to get from me.” Ringing endorsement, I know. I think I had this vague picture in my head of this huge time commitment during the conference, that the person I would be matched with would want to spend more time than I had to give, or that I wouldn’t be able to have the regular catch-up time with colleagues that is always so valuable, because I would be too committed to introducing someone the entire time. Whatever picture I had painted in my head turned out to be completely wrong. Out of the process, I ended up gaining a new friend and colleague who asked very little of me, other than to be interested (which I honestly was) and offer suggestions on people to talk to or suggestions on what not to miss. I enjoyed hearing her take on the meeting as it progressed and I enjoyed learning how OHA was working for someone just entering the field. I hope the experience was as useful for Alise as it was for me. I know I gained a renewed perspective of the conference and the participants and I look forward to checking back in with Alise at the 2015 OHA conference. To learn more about the program, or to sign up as a mentor or mentee for the 2015 OHA conference, contact Ellen Brooks or Stephen Sloan of the OHA Mentorship Committee. Image Credit: “Hold Hands” by Billy Simon. CC BY NC-SA 2.0 via Flickr.